I never visit the Metropolitan Museum in New York without devoting a few minutes to Gallery 501: the Studiolo, or study room, from the ducal palace of Gubbio, dating from 1478-82. 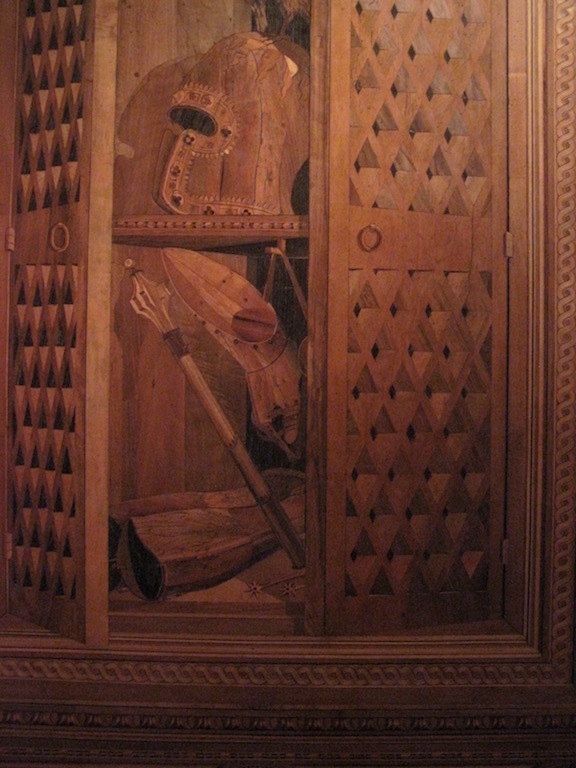 Its murals are executed in intarsia, or wood inlay. Everything between the text band of gold and blue at the top and the red tiles at the bottom, which is the floor of the gallery, is a flat surface, like a painting. 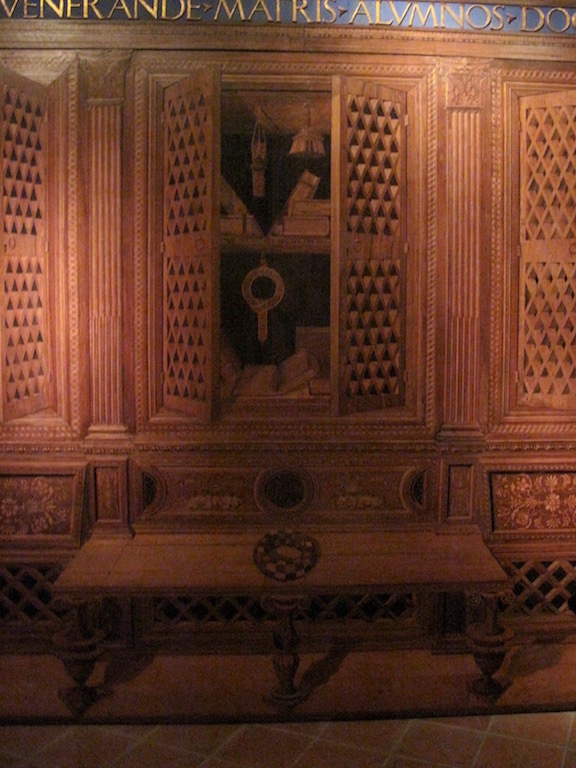 All the “paneling”, the “cabinet doors” seen at various angles, the “objects” inside, the “bench”, the “cast shadows”–everything–is illusion, executed in cut-out shapes of various woods. There is no furniture in Gallery 501, so a standing visitor sees it, as it were, from above. 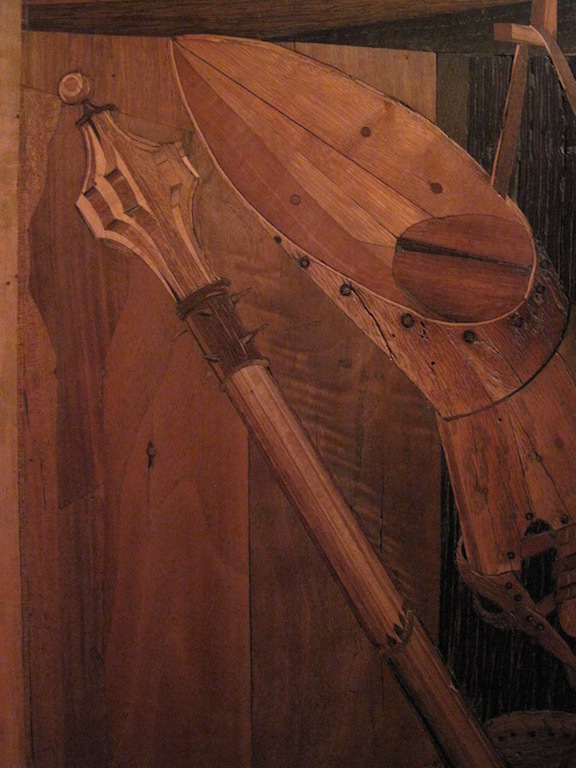 The perspective eye level–just about that round object in the lower part of the cabinet–assumes that the viewer is sitting in a chair. Part of what makes the effect so winning is that there is no attempt to fool the eye. The only colors are the colors of the woods employed, which range from warm light to warm blackish. The illusion is at once convincing and forthrightly playful. The woods are slimmed to uniform veneers, then cut to shape, then placed. It’s a small room, but you can see how it would take years to execute. It was completed the year the duke died. I wonder if he ever had a chance to spend time there.